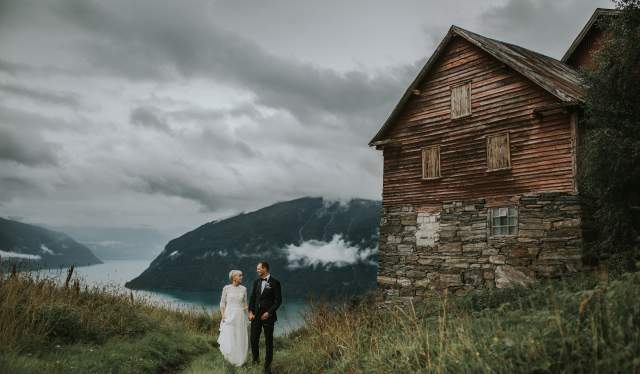 Whether you are ready to wed or not, these wedding photos from around Norway – and the photographers' tips – can be well worth a look. "Good shoes is my best piece of advice," says photographer Christin Eide. And here she is referring to both herself and the bride and groom. This is because several of the couples she has photographed have had to walk a bit in rough terrain. "The couples I have taken along to mountain peaks or other places with special viewpoints might as well be wearing trainers for the hike back and forth. Norway is not all that accessible, so it is rare that you can drive your car right up to these places. Therefore, you have to be willing to walk a little bit," she says. This also pertains to being prepared that things never work out as planned. "They turn out better," she says. 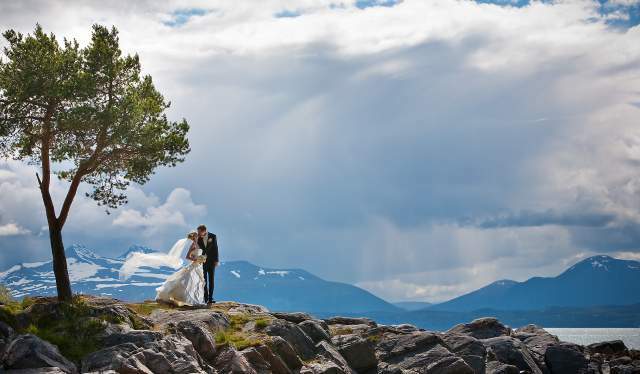 Eide believes that Iceland, which has long been popular among Norwegian and foreign bridal couples and wedding photographers, may soon risk being overtaken by Norway. 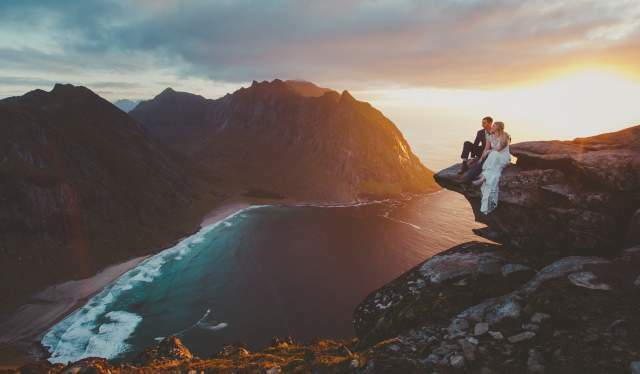 "Norway is at least a good number two when it comes to wedding photography. Here we have both mountains and fjords, and the scenery is a bit magical." Time is important, according to photographer Michaela Klouda. 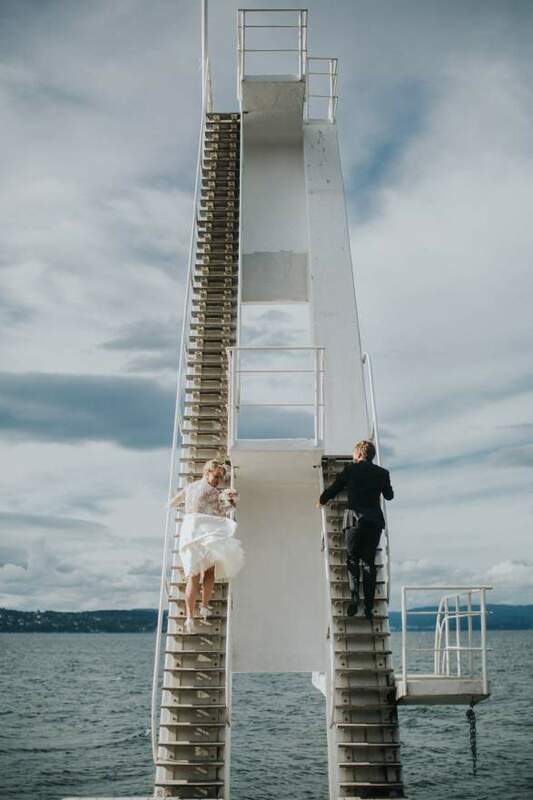 Because if you intend to make it up to the top of a mountain or some other location a bit off the beaten path, it&apos;s rarely wise to try and squeeze it into the wedding schedule. 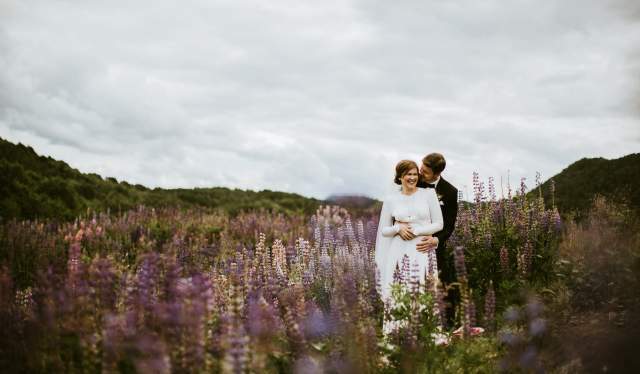 "If it is possible to head off and take wedding photos the next day instead, you will not only have more time, you also don&apos;t need to be so worried about the dress or your hair and makeup," says Klouda. She likes to take a drive with the bride and groom the day before the wedding, so that they can check out potential spots together. "They tend to be familiar with the area already, and often have some places in mind. At the same time, I need to see how the sun will be positioned so that I know where the light falls." She is keen to find new places, so that everyone isn't taking their wedding photos at the same spots. "Some areas may be a little over-used, therefore it's a good idea to try to think outside the box. Instead of holding your wedding in a hotel, you might want to find a barn or garden where you live," says Klouda. Photographer Terje Aamodt is constantly looking for new and special places. And he sometimes encounters particularly fit couples who are more than willing to combine the photo shoot with a strenuous bridal excursion. 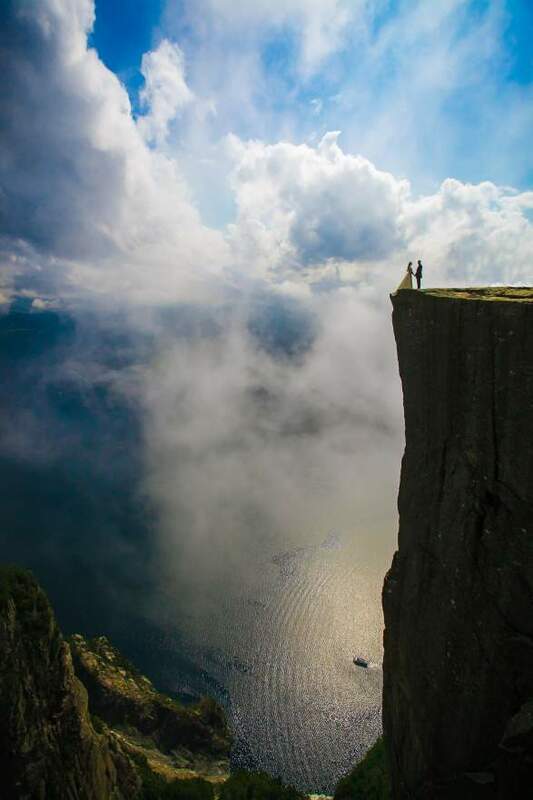 "I photographed one couple both at Pulpit Rock (Preikestolen) and at Romsdalshornet because the groom is from Stavanger and the bride is from Romsdal," says Aamodt. Both sites require a certain amount of effort to reach, especially the latter. 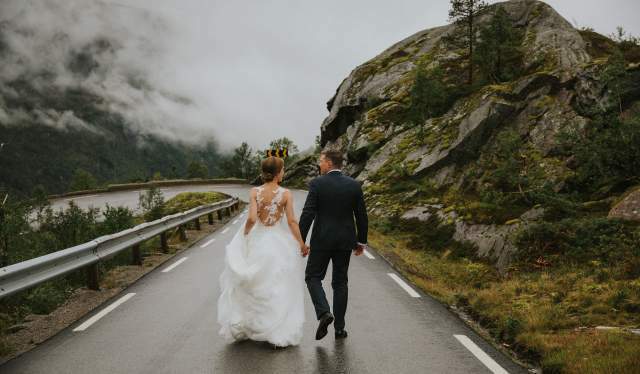 "The bride's father had been given a guided tour of Romsdalshornet as a birthday gift, but he had no idea that the bride and groom had brought a suit and dress in their backpack," says Aamodt. 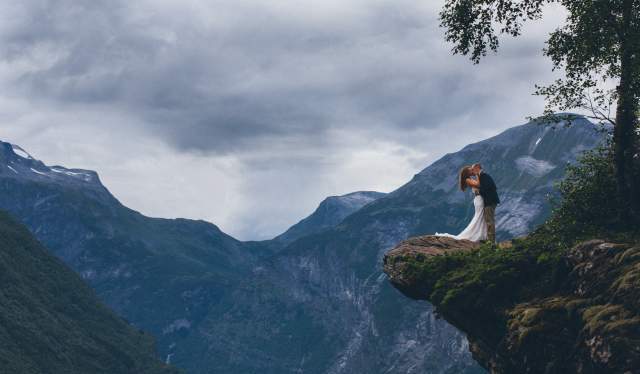 So after climbing several pitches wearing climbing shoes and a harness, they changed into the appropriate attire for their wedding pictures at an elevation of 1,550 metres above sea level. "It was very sporting of them," says Aamodt, who very much appreciates getting to do photo shoots at unique locations and with plenty of time to be creative.